A monorail is a railway system in which the track consists of a single rail, typically elevated and with the trains suspended from it. The term is also used to describe the beam of the system, or the vehicles traveling on such a beam or track. Many monorail systems run on elevated tracks through crowded areas that would otherwise require the construction of expensive underground lines or have the disadvantages of surface lines. Calabar Nigeria Intamin P8 monorail A 1.1 km Intamin P8 monorail in Calabar in Cross River State opened in April 2016. Sun City South Africa Sun City Casino Resort Monorail Casino Linking day visitor parking area to main complex. Alton Towers UK Alton Towers Monorail 1987 2 1.4 km (0.87 mi) Resort Park Trains were originally used at Expo 86 in Vancouver, British Columbia, Canada. Aiea, Hawaii US Pearlridge Skycab Other Pearlridge Center. Connects the Uptown part of the mall to the Downtown part of the mall. It is the only monorail system in Hawaii. Fairfield, Ohio US Jungle Jim's International Market Monorail Other Brings riders from a remote parking lot to the Oscar Events Center; cars were originally used at nearby Kings Island. This is a listing of operating monorails that are open to the public. Only true monorails (vehicle wider than track) are included; see people mover for a list of monorail-like systems. The Walt Disney World Monorail System. Niterói, Brazil. Had received the go-ahead from Dilma Rousseff and will connect Niterói, São Gonçalo, and Itaboraí, before the State considered implementing a heavy metro solution instead. São Paulo, Brazil has a project (Line 17) to build a monorail that will connect Congonhas Airport to Morumbi and Jabaquara districts. São Paulo, Brazil has another project (Line 18) to build a monorail that will connect São Paulo to the neighbour ABC region. As part of the DestiNY USA project in Syracuse, a monorail from Syracuse University to Syracuse Hancock International Airport via downtown and the DestiNY complexes is planned. Quebec, Canada. For many years, plans for a high-speed transit system have been tabled. Since the cost for a new train would be too high and that it wouldn't be fit for the Québécois winters, the option for a monorail has been debated. In late 2012 TrensQuébec released two newsletters stating that they've found enough investors and supporting politicians to build a 5-kilometer test track. Vargas, Venezuela. Proposed. The system would be part of state of Vargas new governor's transportation plan. The project would connect 5 cities: Catia La Mar, Maiquetia, La Guaira, Macuto and Caraballeda. The Swiss corporation Intamil presented the proposal. The trains will ride around 80 km/h and will translate about 60.000 passenger per hour. Panama City, Panama. Panama City Metro Line 3. Currently in contractor selection stage. Expected EIS 2022. Thessaloniki Monorail, Greece, proposed monorail line that will start at Mikra Station and end at Makedonia International Airport. The plan is unlikely to be realised as an extension of the metro to the airport is preferred. MCH Skybus, Herning, Denmark - MCH's 2025 vision includes a monorail system between the exhibition centre and the town centre. Rio de Janeiro had a private monorail that linked Barra Shopping mall to its parking lot. Only one part of the track and the platform still remain, in the parking lot (second floor, behind the Fnac dome). Expo 86 in Vancouver, British Columbia had a monorail that was moved to Alton Towers in the United Kingdom. The Minirail at Expo 67 in Montreal, which joined Pleasure Beach Blackpool in purchasing rail and rolling stock from the monorail system at the 1964 Lausanne exposition, along with new rail cars from the manufacturer. The Boynton Bicycle Railroad was a monorail on Long Island, New York, which ran on a single load-bearing rail at ground level with a wooden overhead stabilising rail engaged by a pair of horizontally opposed wheels. Busch Gardens Tampa Bay had a monorail, the Veldt Monorail. It shut down in 1999. Busch Gardens Williamsburg had a monorail, Eagle One, that connected the theme park with the nearby Anheuser-Busch brewery. Park visitors could tour the brewery and return via monorail. Eagle One was dismantled in the 1990s. Carowinds operated the Carowinds Monorail from 1973 through 1994. The Centennial Monorail was demonstrated at the Centennial International Exhibition of 1876, which was held in Philadelphia (Pennsylvania) to celebrate the 100th anniversary of the Declaration of Independence. The Epsom Salts Monorail was "the fastest moving monorail in the world" when it was built from 1922 to 1924 by Thomas Wright, a florist from Los Angeles, who had discovered magnesium salts southwest of Death Valley. Fairlane Town Center in Dearborn, Michigan (outside of Detroit) had a shuttle monorail that connected to the Dearborn Hyatt Regency Hotel to the Fairlane shopping mall. The Trailblazer suspended monorail ran from October 1956 until 1964 at Fair Park in Dallas, Texas. The single monorail car was used in Houston for a demonstration prior to its relocation to the State Fair of Texas. Kings Dominion near Richmond, Virginia had a monorail as the conveyance for visitors to its Lion Country Safari attraction, which was removed after the 1993 season. The Pelham Park and City Island Railroad in the Bronx, New York operated a short-lived monorail system in 1910. It ceased operation after an accident. The Philadelphia Zoo had a monorail in the 1970s and 1980s, but was discontinued in the 1990s. The Wgasa Bush Line at the San Diego Wild Animal Park near Escondido, California was shut down in March 2007. Flushing Meadow Park New York, New York had a monorail during the 1964 New York World's Fair. It was a proof of concept with only one station. It was sponsored by American Machine and Foundry. Jungle Jim's International Grocery Store near Cincinnati, Ohio maintained a monorail circulator purchased from Kings Island Theme Park. However, plans are in motion to bring the monorail back online in the future to shuttle people from the grocery store's hotel to the store. Six Flags Magic Mountain operated a monorail since the park's opening in 1971 and shut down several years ago due to lack of parts. Fairplex operated a monorail built by the American Crane and Hoist company. The middle 90s saw a new station and new cars built by Arrow Dynamics. The new cars were far heavier than the original and caused it to last only a couple of years more until it was dismantled. Santa's Village in Skyforest had another American Crane and Hoist monorail that shut down when the park went defunct. The Minnesota Zoo operated a monorail around the grounds of its Apple Valley, Minnesota site from 1979 until 2013. Tehran Monorail, Tehran. Project cancelled after completion of 3% of construction work. Sunway Monorail, Petaling Jaya, Malaysia. Served Sunway City, including Sunway Pyramid mall and Sunway Lagoon theme park and the surrounding. Decommissioned and partly dismantled to allow mall expansion. It being replaced by BRT Sunway Line. Sentosa Monorail, Singapore (1982–2005). Replaced by the Sentosa Express monorail. Fashion Island Monorail, Bangkok, Thailand. Short indoor amusement park monorail in Fashion Island shopping center. Decommissioned due to an accident that killed 2 riders. Tuk-Tuk Monorail, Bangkok. Half indoor-outdoor monorail tour operated between LeoLand amusement park and the water park. The track survives in the 6th floor of Central City Bang Na. Milngavie, near Glasgow, had an experimental high-speed propellor-powered monorail, the Bennie Rail Plane, built during 1929-30 and abandoned during the Great Depression. Birmingham Airport had a magnetic levitation train which had to be closed down due it becoming life expired and a lack of spare parts. It was later rebuilt as a more conventional elevated rail system. Lartigue Monorail in France and Ireland. A restored 1-kilometre (0.62 mi) section now operates in Listowel. Safari Skyway, Chessington, United Kingdom (1986–2015). Operated in Chessington World of Adventures. Merry Hill Shopping Centre, Brierley Hill, West Midlands had a Von Roll Mk III Series monorail which opened in June 1991 but only worked for a short while before finally being sold off in 1996. The rolling stock now operates in Broadbeach, Queensland, Australia. Reasons for the closure of this system include a combination of technical problems and safety concerns (especially the difficulty of evacuation), exacerbated by a dispute between the owners of Merry Hill and The Waterfront which at this time were owned separately. France has two abandoned test tracks for the Aérotrain, which can be considered monorails. One is between Limours and Gometz-la-Ville and the other between Saran and Artenay. France also had a suspended monorail the SAFEGE that featured in the film Fahrenheit 451. Russia had one suspended monorail built in 1899 at a leisure park. A horse-pulled monorail was already built in 1820 in Myachkove near Moscow. Phantasialand: Phantasialand Jet (1974-2008), closed and removed. Manufacturer was the german theme park ride manufacturer Schwarzkopf. Brisbane, Queensland had a Von Roll Type II monorail built for World Expo '88. Four sets, consisting of nine carriages each, operated in a continuous loop throughout the Expo site. A single train set and some track was sold to Sea World, Gold Coast, in 1989 for expansion of its monorail system. The remainder of the sets and track were bought back by Von Roll. Oasis Shopping Centre, Broadbeach, Queensland ran between the shopping centre and Conrad Jupiters Casino. The Von Roll Mark III monorail, owned by the Oasis Shopping Centre, consisted of two 4-carriage trains. Two spare carriages that were removed when the system switched from 5-carriage to 4-carriage trains were also kept with the two trains. Most components were original to the Oasis Monorail, but some were sourced from the UK Merry Hill Shopping Centre's former monorail that closed in 1993. As of July, 2017, most of the monorail system has been removed (closed on 29 January 2017). ^ "Companhia do Metropolitano inaugura quatro estações da Linha 15-Prata" [Metrô company opens four stations of Line 15-Silver]. São Paulo.sp (in Portuguese). Governo do Estado de São Paulo. 2018. Retrieved 2018-04-06. ^ "重庆轨道交通3号线北延伸段开通迎客-中新网". China News. 28 December 2016. Retrieved 28 December 2016. ^ Transportation. "New Contract for P8 Monorail System in Calabar". www.intamintransportation.com. ^ "Nasrec Development - Stage 2: Business Plan" (PDF). Johannesburg Development Agency. September 2005. Archived from the original (PDF) on October 6, 2006. Retrieved 2008-12-12. ^ "Sun City Transport". Retrieved 2009-10-21. ^ "Plaza Imperial Monorail - a Photo Essay". The Monorail Society. Retrieved September 7, 2016. ^ "Ashgabat". Intamin Worldwide (Press release). Retrieved July 2, 2018. ^ a b "Nigeria". Railpage. Retrieved July 2, 2018. ^ "Evalúan construir un monorriel junto a la Panamericana". ^ "Rousseff to sign agreement for US$875mn monorail construction in Rio - BNamericas". 6 September 2013. ^ "Bombardier construirá monotrilho em São Paulo". ^ "Monorail to Sherbourne suggested". The Nation Newspaper. 2008-04-24. Retrieved 2008-04-27. ^ a b c Joseph P Schwieterman (2007-09-01). "Return of the inter-city train". Railway Gazette International. p. 563. ^ Young, Adam D. (January 4, 2014). "Texas Tech to downtown monorail could more than a daydream for Lubbock, McDougal says". Lubbock Avalanche-Journal. Archived from the original on February 16, 2014. ^ "Noticias del Perú y el Mundo - El Comercio Perú". El Comercio. ^ Ogden, Eric; Senior, John (1992). Metrolink. Glossop, Derbyshire: Transport Publishing Company. ISBN 0-86317-155-9. ^ "Preston council chief proposes monorail service". 2008-04-23. Archived from the original on May 17, 2008. Retrieved 2008-04-27. ^ "6. fase - Svævebane". MCH. Retrieved 20 August 2011. ^ "Brisbane Airport master plan proposes monorail to link terminals and parking areas". Brisbane Times. March 31, 2014. Retrieved 30 September 2017. ^ "MELBOURNE AIRPORT MONORAIL". Retrieved 30 September 2017. ^ "Nelson man pitches monorail option as alternative to Southern Link road". Stuff. ^ Gold, John Robert; Margaret M. Gold. Cities of Culture. Ashgate Publishing. p. 122. ISBN 978-1-84014-285-3. Retrieved 12 November 2011. ^ Beauchamp (January 1997). Exhibiting Electricity. Institution of Electrical Engineers. p. 287. ISBN 978-0-85296-895-6. ^ Pendergrast, Lolo (August 23, 1994). "Carowinds retires monorail attraction". The Charlotte Observer. p. 1C. ^ Magazines, Hearst (June 1956). Popular Mechanics. Hearst Magazines. p. 77. ^ "Skytrail - Minnesota Zoo". 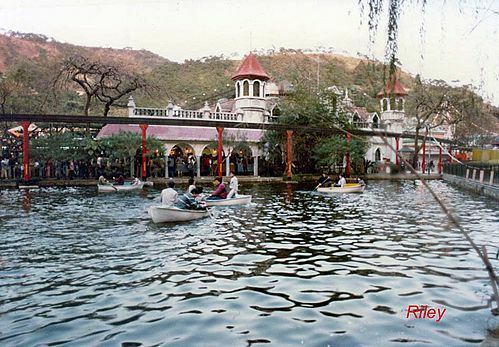 Amusement Parkives. Retrieved July 2, 2018. ^ "Monorail News Archives - January 9 through March 19, 2005". 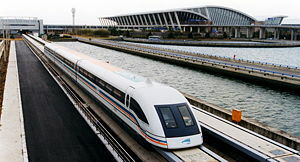 www.monorails.org. ^ Beesley, Paul (2008-07-04). "Behind the scenes - A closer look at Blackpools Monorail". Ridemad. Retrieved 2008-10-09. Pleasure Beach Blackpool bought the monorail in 1964 from the Lausanne expo in Switzerland and it was opened in Pleasure Beach in 1966. ^ "End of the line for Blackpool's Monorail | Airgates". Airgates. 2012-11-05. Retrieved 2018-06-25. ^ "Sydney's monorail to make its final stop on June 30 next year". ^ "Long-time driver Les Davis says goodbye to the Broadbeach monorail as redevelopment starts". This page was last edited on 17 April 2019, at 17:34 (UTC).